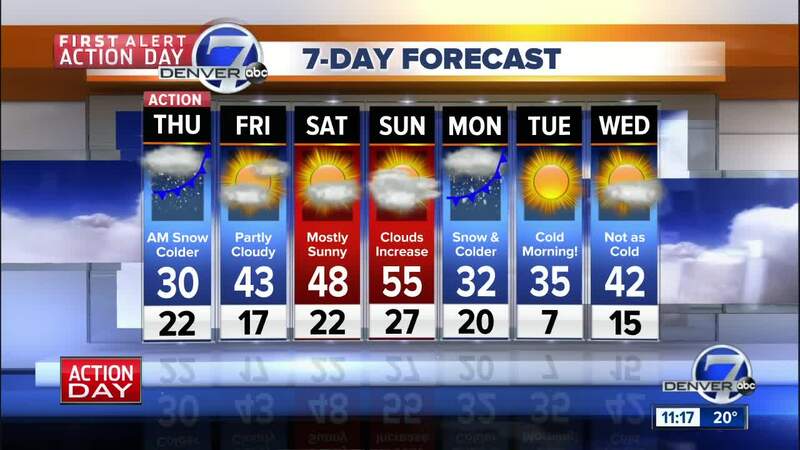 This is the Denver7 breaking and developing weather news blog. Throughout the day, this story will be updated with both minor and large breaking news events that our readers care about when it comes to weather. Check back as we continue to update this story. 12:25 p.m. — Westbound I-70 has reopened between exits 363 and 361 in Limon after crews cleaned up a crash involving three semi-trucks . There are also high wind advisories from mile marker 0 to 91 on I-25 in southern Colorado. 11:39 a.m. — We're starting to see the aftermath of the snowstorm as some highways begin to reopen, including Highway 93. 11:17 a.m. — CDOT says that westbound I-70 is now open from Limon to Denver, but remains closed between exits 361 and 363 in Limon while crews continue to clean up a crash. Westbound U.S. 40 has reopened between Forrest Ave. and I-70 as conditions improve. 11:08 a.m. — We are receiving more information about the multiple crashes that have shut down westbound I-70 between Limon and Agate. A 48-year-old man died in one of the crashes, which happened at mile marker 342 just south of Agate around 7:30 a.m. CSP Trooper Gary Cutler said there were several vehicles involved in the crash, including at least one semi-truck. CSP was still investigating the deadly crash and working to clear it at 11 a.m. The second crash happened just before 10 a.m. at mile marker 362 near Limon. It involved three semi-trucks, including one that jack-knifed. Cutler said there were no injuries reported in that crash. 10:49 a.m. — There's quite the difference at the moment between Denver and Fort Collins! Click here for live radar. 10:45 a.m.— I-70 remains closed at Limon because of crashes, and Highway 287 remains closed in some stretches in eastern Colorado as well. The latest updates can be found on the COTrip website. 10:23 a.m. — Here's a look at the semi-truck crash that has closed westbound I-70 between Limon and Agate. There is no estimated time of reopening. Westbound U.S. 40 is also closed between Forrest Ave. and I-70 because of the crash on I-70, CDOT says. 10:12 a.m. — I-70 has reopened between Rifle and Silt after it was closed because of several crashes, CSP says. We're also still seeing some poor driving conditions across the Front Range, which have caused several crashes. 10:01 a.m. — Westbound I-70 remains closed between exit 363 and exit 340 because of crashes between Limon and Agate, CDOT says. 10 a.m. — Here's a look at conditions on I-25 in the south metro area this morning. 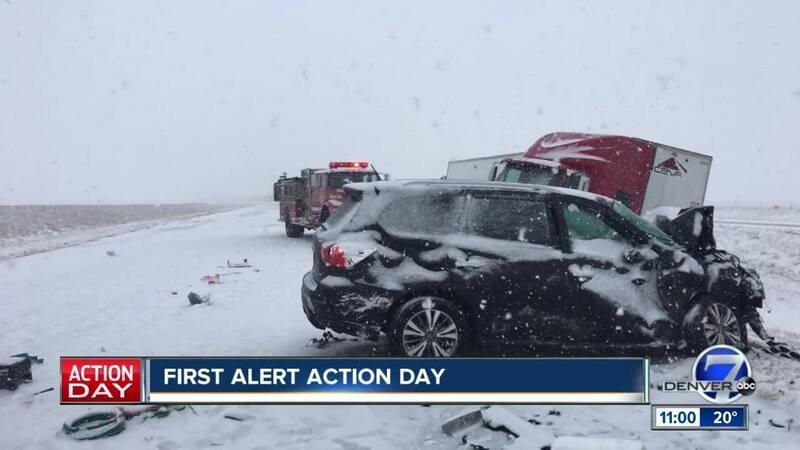 9:48 a.m. — Wheat Ridge police are now on accident alert, along with Aurora, Douglas County, Boulder (city), Elbert County, Longmont, Northglenn and Commerce City. This means that if no injuries, alcohol or drugs are suspected to be involved in a crash, people should exchange information and can file reports online within the next 24 hours. 9:44 a.m. — Eastbound I-70 has reopened at exit 90 (Rifle) after a crash, as has westbound I-70 at the Garfield County Regional Airport, according to CDOT. 9:37 a.m. — Denver police say they have responded to 44 crashes so far this morning as snow falls in the city. 9:36 a.m. — There is a crash on southbound E-470 that is blocking the two left lanes near Parker Road. 9:17 a.m. — Some flights arriving to Denver International Airport are being delayed by up to an hour because the FAA's Traffic Management Program is in effect. Departing flights could see some slight delays as planes de-ice. There is a crash on Pena Blvd. that is causing traffic for those headed out to DIA, the airport says. 9:15 a.m. — There are several cities and counties on accident alert: Aurora, Douglas County, Boulder (city), Elbert County, Longmont, Northglenn and Commerce City. Colorado State Patrol is also on accident alert for the unincorporated areas of several counties the agency covers. 9:11 a.m. — Southbound CO 93 is closed between CO 128 and CO 72 because of crashes, CDOT says. There is currently no estimated time of reopening. 8:57 a.m. — I-70 is closed between Limon and Agate — southeast of Denver — for a two-vehicle crash, CSP says. 8:54 a.m. — Westbound I-70 is closed at the Silt exit because of several crashes in the area, CDOT says. The alternative route is U.S. Highway 6, but drivers in the area should expect delays. CDOT also says there are winter driving conditions along I-25 between exit 149 and exit 163 north of Colorado Springs. 8:36 a.m. — DIA officials say there are currently 32 delays and two cancellations, but these are standard, even in good weather. To check your flight status, click here . 8:30 a.m. — Limon police say that I-70 is closed westbound from Limon because of multiple series crashes in Elbert County. 8:20 a.m. — Highway 72 is closed in the westbound lanes at Highway 93. Authorities are working at a reported plow vs. car crash that is blocking the road. Injuries are unknown, according to Colorado State Patrol in Golden. 8:18 a.m. — The commute from Fort Collins south to Denver is dicey this morning. Denver7's Major King advises leaving about twice as much time as normal to get to your destination. 8:05 a.m. — Colorado State Patrol in Eagle is reporting a major crash with serious injuries and a fire on I-70 between Rifle and Silt. The eastbound lanes of I-70 are closed at mile marker 90. 7:37 a.m. — The snow has arrived in the Denver metro area. Drive slow and carefully, as the roads are becoming slick and visibility is low. 7:21 a.m. — Road conditions are slick and visibility is low on both sides of the Eisenhower Tunnel. 6:48 a.m. — Traffic is slowing on Highway 66 in Mead due to windy and snowy conditions. 6:39 a.m. — The wind and snow are picking up in Longmont near I-25. Denver7's Micah Smith is reporting that visibility is OK in this area. 6:32 a.m. — White-out conditions have been reported near Platteville on Highway 85. CDOT is ruging drivers to drive slow through these conditions. 6:23 a.m. — The wind is picking up in Johnstown near I-25. Traffic is slow. 6:16 a.m. — Tamara Rollison with Colorado Department of Transportation said there is a good amount of residual treatment left from the previous storm, so CDOT is not pre-treating most roads. About 100 plows are ready to go as soon as the snow starts, she said. She recommends leaving home a little earlier than usual today. 4:57 a.m. — Snow started to fall at the Denver International Airport. According to the FAA, this is not impacting flights.